Yes, I WAS the hottest juror in the room today. I don't know what, exactly, possessed me to wear a tie to jury duty. But I daresay I was one of the sharpest dressed civic-duty-doers in the vicinity. Admittedly, I *did* get looks from some the other jurors--and the bathroom was a Small Issue as well. My DGF accused me of liking the attention that I get (even negative attention) as a tie-sporting she-person. I disagreed, telling her I just like to be "comfortable." But as my DGF pointed out, that's not totally true, since arguably I could have been just as comfortable without the tie and garnered fewer significant looks from my fellow prospective jurors. Here's the deal. First, I felt like looking sharp. And the variety of usual ways women look sharp (make-up; a nice purse; other things that flummox me) is not comfortably available to me. Second, I felt that as long as I was doing ONE civic duty, I might as well do another one and provide some much-needed homo-visibility for my fellow county residents. Today's outfit, by the way, exemplifies an acceptable way to pair two striped patterns: a shirt with very thin stripes and a tie with much wider ones. The conventional wisdom is to stick with solid or patterned ties if your shirt is striped, but in my opinion, this is outdated. Simply don't pair two striped patterns if the stripes in each have similar width. And if you want to be extra safe, make sure that at least one of the colors in the shirt (not counting white) is the same as one of the colors in the tie. This (like many other fashion fundamentals) is a useful guideline, not a hard-and-fast rule. 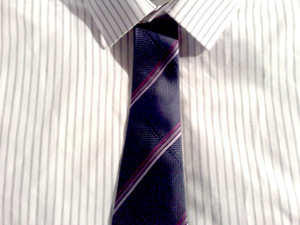 For some other examples of striped shirt-and-tie pairings, you can check out some nice examples. boi you do whatever feels right for you, hun!! i don't get all the tie matching stuff. y'alls ties with your shirts are a little different than i (femme) would do things. but, whatever...y'all look friggin' hot! and if you're comfortable in it, too! MEOW!!! i say!